Summer is fast approaching, and with the absence of spring weather it’s time to get our bikini bodies in shape (yes it’s that time of year again). If you are anything like me, getting into shape didn’t cross your mind until the sun decided to come out of hibernation and finally melt away all that snow. The only problem is, summer has come without a warning and I’m not ready! 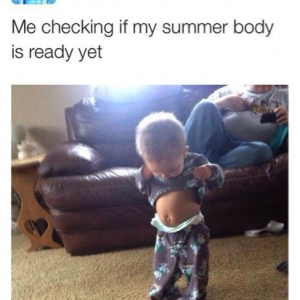 Now that the countdown is on, with only one month before summer hits full force, it is time to end those depressing trips to the mirror. Today I have a few tips and tricks to take note of to help you take off that weight and keep it off! Now that the weather is nice and patio season has fast approached, the temptation is stronger than ever! Do not eat out Monday – Friday, not for breakfast, lunch, or dinner (yes a coffee is acceptable). Eating out increases your calorie intake. Although you may think you may be choosing a “healthy” option, you still don’t know how it is prepped. If you can hold out during the week, you can indulge on the weekends. Getting yourself into a steady routine can help you to lose weight and keep it off! Face it we all love junk food, however it seems almost impossible to break the craving. The best way to avoid eating it is to not buy it in the first place! However, lets say we gave into that temptation in the grocery store and bought that bag of chips. Mistake number one is bringing the whole bag to the couch with us when we know were going to regret it. So if that bag of chips made it home from the store with you and somehow ended up in your pantry, portion a serving in a separate bowl and eat just that. The trick is to fool your brain into thinking you’ve had enough. Summer is fast approaching, and I know we all have at least one body part that we’re trying to tone. Whether that is your stomach, legs, or arms, when you are working out you need to put the focus on your whole body. Many people get discouraged when they begin working out because they aren’t seeing direct results. My advice is to be patient. When you begin to exercise its important to take note that weight is evenly disrupted throughout your body, so you will evenly lose weight. Just because you want to loose three pounds from your thighs doesn’t mean that’s the first place to lose everything. If you’re doing the correct workouts you will see an overall weight loss in your figure. I want to clear something up right now, it is a MYTH that diets work. Oprah is a great example of this. Back when she was filming the Oprah Show, she went on a liquid diet to lose weight. Boy! Did she lose the weight! However, when she went back to her regular diet, after she finished her cleanse, Oprah put on more weight than she ever had before. This happened because when she was on the liquid diet she fooled her body into thinking she was full. The reason she began to gain so much weight after her diet was because when she began eating regularly again, her body began to store food. It was out of her control because her body was preparing to be starved again. Diets don’t work, eat regularly and healthy and you’ll watch the weight fall right off. This is often the most overlooked part of losing weight. With constant entertainment to keep our attention, most people don’t go to bed until they fall asleep in front of the T.V. only to wake up six hours later to go to work. It’s proven that humans loose calories when we sleep. However, it’s hard for our bodies to regenerate and process those calories if we never properly relax and shut off the world. Take the time to sleep in your own bed with nothing but the sound of a fan or window open. You’ll wake up in the morning more refreshed and ready for a new day. Put these 7 actions into play the next 30-60 days and you’ll have a fitness routine to build your summer body and maintain it year ‘round. Want a sweet treat without the guilt try these high protein no carb Paleo Apple Almond Muffins. Satisfy without the Guilt. I don’t know about you but I have a sweet tooth. I’m constantly looking sugar free, low carb, high protein treats to satisfy my cravings and keep me on track. I came across this amazing recipe and it’s super easy and quick. They are called Paleo Apple Almond Muffins and they are delicious. Why almond flour? With lots of gluten free options almond flour is highly nutritious, easy to use and readily available. If you are watching your weight, almond flour is high in protein, low in carbohydrates and low in sugars. Because these are high in protein they actually help you stay fuller longer, so one is all you need. Unlike other alternatives to wheat flour, almond flour is moist and delicious. It makes one mean muffin and I know you’re going to enjoy! Preheat oven to 350. Combine all ingredients together and put into lined muffin tin. Bake for 20 – 25 minutes, or until golden. *Please note these don’t rise too much since they’re gluten-free. Let them cool a bit and enjoy!